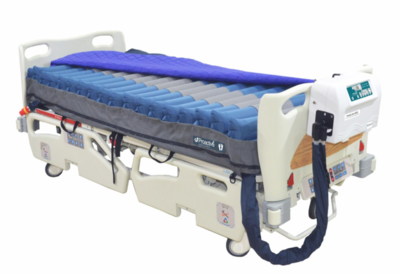 The 48" true low air loss 99MAX, This True Low air loss mattress system is commonly used in many hospitals for healing and preventing all stages of bedsores. It offers an extraordinary therapeutic benefit that is used for a wide variety of patients for optimal comfort, pressure relief, and healing of up to stage 4 bedsores. This bariatric low air mattress is ideal for pain management using 3 distinct therapy modes for advanced healing and patient comfort. Alternating pressure therapy mode sets the new standard in the prevention and treatment of pressure ulcers. The caretaker can easily change the alternating cycles from 10-15 minute cycle to promote consistent blood flow or an extended cycle of 20-30 minute to increase blood flow over an extended period of time. Pulsation mode- reduces the air flow every 30 seconds to 50% of the comfort setting. This feature adds enhanced comfort and healing benefits and will intermittently reduce pressure and increase blood flow. Pulsation allows the patient to immerse into the mattress to offset pressure gently to the patients body. Pulsation cycle times can be adjusted from 1 minute - 20 minute pulsation cycles. On demand true low air loss- produces 1200 LPM (liter per minute) of air flowing directly under the patient. The constant high flow of air keeps the patient cool, dry and virtually free of perspiration. True low air loss therapy is designed to wick away moisture, preventing heat and moisture build up and protecting the skin from sheering and breakdown. The powerful user friendly pump is ideal for a long term care setting. 10 zone digital comfort control allows the pressure to be customized by a patients weight. The 9900 series pump produces a consistent 1200 liters of air flow per minute including a bariatric mode that can enhance air output for patient support. Low sheer 4 way stretch cover protects the skin from sheering. It has a 4 way zipper and is easy to remove and wash in normal laundry. Staticfloat mode allows the patient to transfer out of bed safely and easily. Audible and Visual Alarm notifies caretakers in the event of power failure. Unique Cell on Cell Design provides the patient with an extra layer of protection in the event of a power failure. 1200 LPM (liters per minute) true low air loss. On Demand low air loss, Pulsation and Alternating pressure combined in one pump. 10 pressure level settings help customize to each individual patient requirements. Alternating Pressure Mode with Adjustable Cycle Times. Digital cycle time display range from 5-30 minutes. Auto firm for quick 1 minute mattress inflation. Cell-on-cell air bladder system prevents the patient from bottoming out in case of a power failure. Quilted nylon waterproof top cover provides additional patient comfort. Lock out feature prevents disruption of clinicians pump settings. Static function suspends the pulsation mode to provide firm support for safe egress and ingress from bed. Audio and visual power failure alarms.